Dozens of connected devices in our homes, and around us every day creates a huge opportunity for brands to connect with and engage consumers in whole new ways. 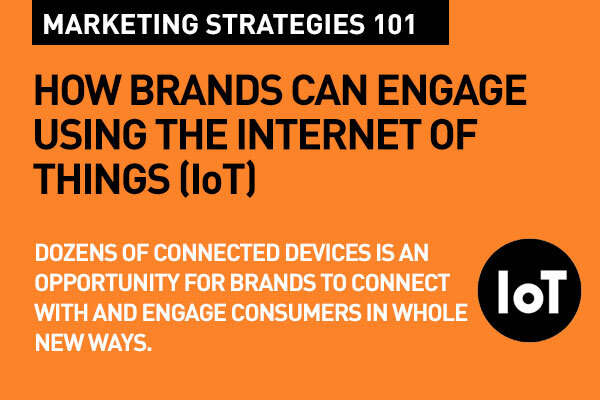 For brands in the B2C sector in particular, engagement will be core to employ the benefits of marketing via The Internet of Things (IoT). Digital marketing via connected devices is way ahead of the way brands have reached out via people's laptops and mobile. IoT is about connecting the various items we interact and engage with throughout the day and delivering solutions in the here and now, adding value, and providing to the customer's needs. With IoT, brands have a whole spectrum of new ways by which they can connect with and deliver value to the consumer, and to create a lifestyle around those interactions – not advertising products, but creating experiences that are meaningful. This is a whole new channel. A channel called utility. Tens of billions of IoT sensors will appear, embedded in connected objects. A Forrester report suggests that marketers will need to develop experiences rather than managing products – a process to which mobile phones will be key. And it will be built around providing convenience. Read related topic about Use the Power of Here and Now: Convenience Marketing with Wearables. IoT will "enable marketers to listen to consumers and analyse their real behaviours, interact with consumers more frequently and in a more intimate way, as well as differentiating their customer experiences. They will also be able to build new offerings and business models." The report adds "Even if IoT application are still experimental for B2C brands, marketers should prepare now for the next wave of brand innovation, powered by sensors and connectivity that will explode beyond mobile." Think of utility, and think of consumer or customer intent. Is your brand ready to deliver, connect and engage with the audience based on their every day needs – and not just around your marketing goals? Intent is the new black in digital marketing. In-the-moment marketing is what's hot. If your fridge is talking to your mobile or your watch, shouldn't your brand message be there? If your mobile says you are out of milk, isn't it a great opportunity for a milk brand right there? 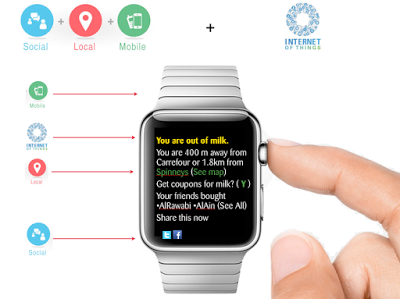 The illustration below shows an example of combining SoLoMo (Social, Local and Mobile) with the Internet of Things. As you prepare to take advantage of this new channel, remember that having a handle on what your audience wants is key. Social media is a great place where you can listen to what people need , what they want. The importance of listening in social media, and how to get it right. Ovens (Miele oven above uses Microsoft technology) can deliver great experiences around recipes. They can deliver the convenience or utility of automated shopping lists. Retail outlets like Amazon are already utilizing the power behind IoT marketing today. Amazon has recently launched an entire line of products and services that make their services accessible throughout your home. 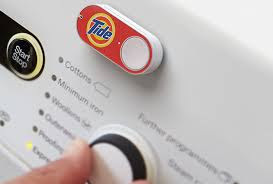 Amazon's buttons that place orders for common household products with a single press and actively-listening devices that respond to voice commands. In today's connected world, IOT cannot do the job as a single channel. It all works together, your mobile marketing, your social media marketing, your Search and your online. The key is to being prepared for this new opportunity – a channel that will endear your brand to the audience by proving solutions to their needs – by providing value and utility. That's what creates relationships, that's engagement. And that's the basics of digital marketing strategies. That's 101. Please share this post with your friends and colleagues today... And do comment if you feel you want to add to this. Advertising vs Engagement. How to win the battle for today's Always On consumer. 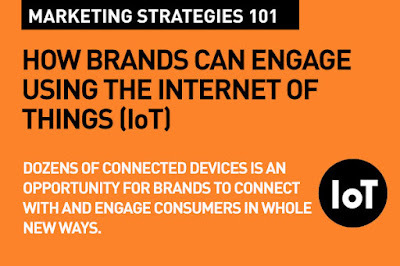 Useful article on the future of marketing with IoT. Already some brands are doing it, connecting wearables, and other devices with mobile. Agree that it is time now for brands to consider this new channel. A great follow up post on what you said yesterday about Wearables Marketing. Both of these are new opportunities, and brands that don't see this, are going to miss the bus. There are around 22 billion connected devices around today according to Gartner studies and reports. If brands are not realizing the potential here, they will really have to play catch up. IoT in automotive sector will create some new channels with in-car marketing coming to the forefront. In home IoT also represents an opportunity for food and beverage, supermarkets etc as well.